Happy 2013! Let's talk about the Tranquility Tunic for this week's Finish-Free Knits sweater, shall we? 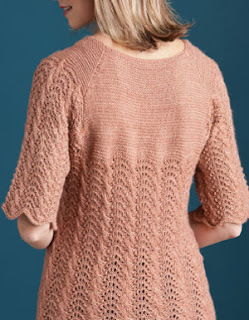 This super-soft tunic has an interesting construction that begins with the body and sleeves worked separately in an easy-to-memorize cabled feather-and-fan pattern. 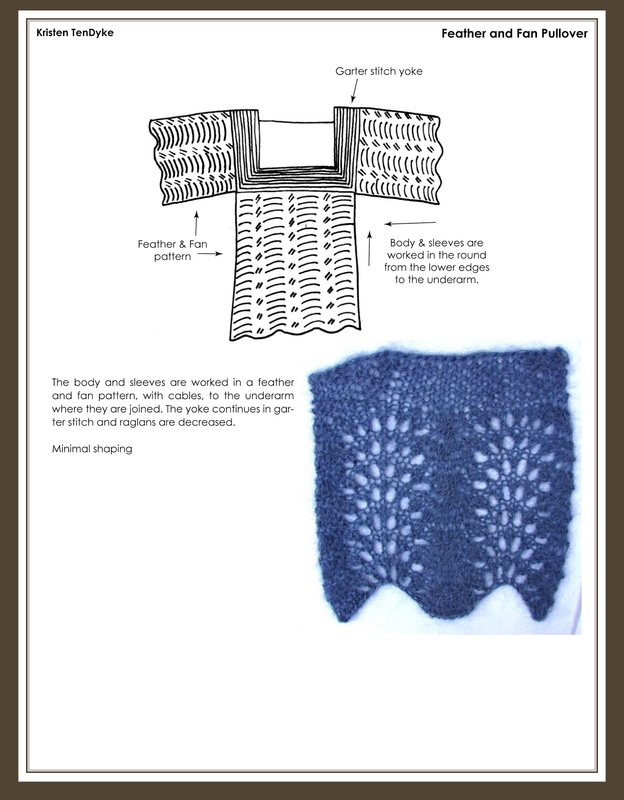 The sleeves are joined to the body with decreases positioned along the body "armholes" and the back neck is raised by decreases positioned along the back sleeves. The remaining yoke is worked in the round with some raglan shaping before the bind-off at the neck. I don't know about you, but I'm beginning to think of warmer weather knits! Maybe not an all-out sleeveless tank top… but maybe something for weather with a little bit more sun. I see this as a great transitional sweater. It's lacy, which is great for warm weather. It's knit in a yarn blended with warm animal fibers, which is great for cool weather. It's short sleeve, which is great for warm weather. It has cables, which are great for cool weather. When I designed this I decided that I really wanted a short raglan section at the front neck. But, from past experience, I knew that the back neck would need to be raised in order to prevent the sweater from falling off the shoulders. So, I had to get a little crafty with the shaping on this one. The body stitches for the back are worked back and forth while working a decrease stitch at each edge to join the sleeves. Then the whole yoke is worked in the round with raglan shaping.